Matthew Mitchell, father of Hon. Samuel Sherman’s wife, was born in 1590; came to America probably on the same boat with Edmund Sherman and son Samuel. Died May 19, 1646. He was a member of the New Haven Court and Judge of local court. ii. Jotham, b. Feb. 27, 1734/35; m. 1, Grace Peck 2, Anne Beers, 3, Cynthia Beers, 4, Rhoda Wheeler. iii. Vashti, b. May 30, 1732.
iv. Sabra, b. Apr. 4, 1736; m. Richard Smith. i. Eve, b. Apr. 24, 1738; m. Phineas Lee, June 22, 1758.
ii. Asenath, b. July 3, 1739, d. July 8, 1739.
iii.Zilpah, b. Nov. 1, 1740; m. Nathan Dickerson, May 19, 1760.
iv. Adah, b. Feb. 6, 1742, d. Mch. 3, 1771; m, Job Bristol, May 31, 1763. Orcutt's Hist. of Stratford and Bridgeport, Ct., Vol. 3, p. 1286, no. 133. Cothren’s Hist. of Ancient Woodbury, Vol. 1, p. 684. 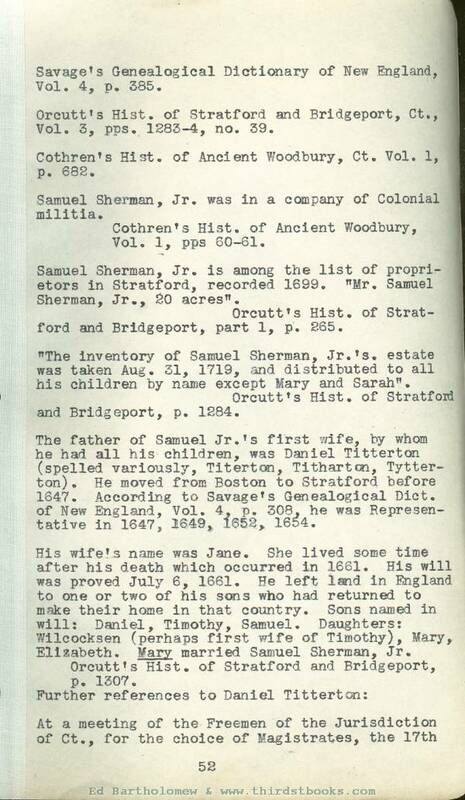 The inventory of Samuel Sherman III's estate is on file in the Probate Records of Danbury, Ct., taken Jan. 25, 1747/48. It shows him to have been a well-to-do man; his land alone inventoried 2795 pounds. 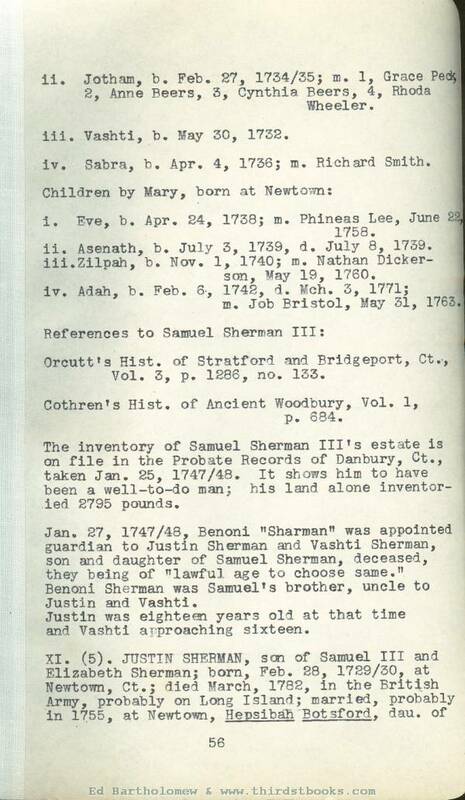 Jan, 27, 1747/48, Benoni "Sharman" was appointed guardian to Justin Sherman and Vashti Sherman, son and daughter of Samuel Sherman, deceased, they being of “lawful age to choose same." Benoni Sherman was Samuel’s brother, uncle to Justin and Vashti. Justin was eighteen years old at that time and Vashti approaching sixteen. Henry, Jr. and Sarah Botsford, who was born at Newtown, and died before April 22, 1779, probably at New Milford, Ct.
i. Betsy, b. 1756; drowned on way to Nova Scotia m. a man named Shelley. ii. Sarah, b. 1758; m. a man named Wilkerson; lived in New Milford. iii. Daniel, b. 1760; d. June 13, 1800, at Hinesburg, Vt.; m. Ollie Peck. iv. Ezra, b. 1760; d. 1825; m. Dinah Fairchild; lived and died in New Milford, Dinah died there in 1826.
v. Eli. b. Mch. 23, 1764; d. June 13, 1850, at Fairfield, Vt.; a. Polly Phelps. vi. Vashti b. 1766; d. after 1785; killed in an accident on her way to Nova Scotia. She married Reuben Lumm of New Milford. vii. Jotham, b. 1768; d. April, 1859; m. Hannah Hatch, who died Nov. 29, 1858, "aged 80 years They lived and died in New Milford. 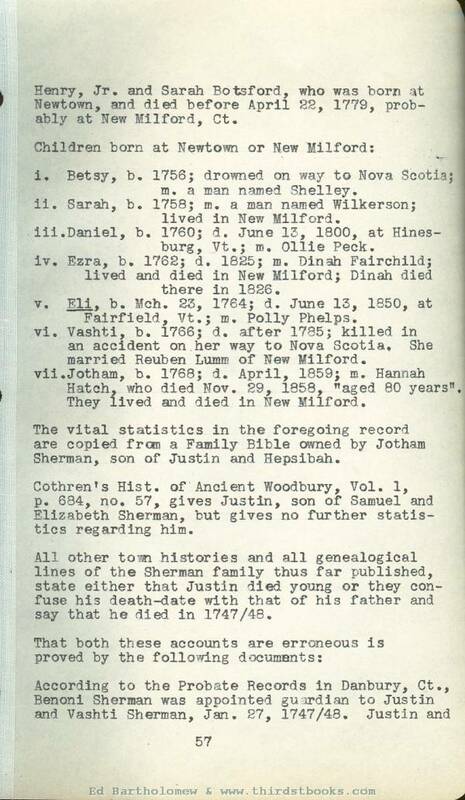 The vital statistics in the foregoing record are copied from a Family Bible owned by Jotham Sherman, son of Justin and Hepsibah. Cothren’s Hist. of Ancient Woodbury, Vol. 1, p. 634, no. 57, gives Justin, son of Samuel and Elizabeth Sherman, but gives no further statistics regarding him. All other town histories and all genealogical lines of the Sherman family thus far published, state either that Justin died young or they confuse his death-date with that of his father and say that he died in 1747/48. Vashti were son and daughter of Samuel Sherman, deceased, and Benoni was Samuel’s brother. 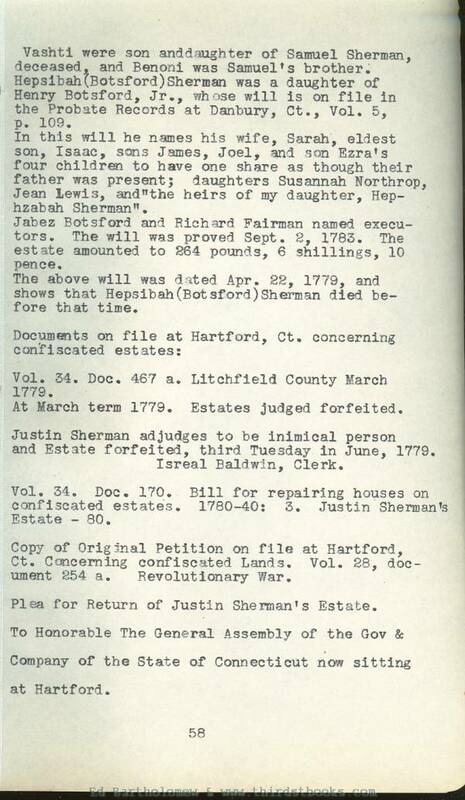 Hepsibah (Botsford) Sherman was a daughter of Henry Botsford, Jr., whose will is on file In the Probate Records at Danburv, Ct., Vol. 5, p. 109. In this will he names his wife, Sarah, eldest son, Isaac, sons James, Joel, and son Ezra's four children to have one share as though their father was present; daughters Susannah Northrop, Jean Lewis, and "the heirs of my daughter, Hephzabah Sherman". Jabez Botsford and Richard Fairman named executors. The will was proved Sept. 2, 1783. The estate amounted to 264 pounds, 6 shillings, 10 pence. The above will was dated Apr. 22, 1779, and shows that Hepsibah (Botsford) Sherman died be- fore that time. Vol. 34. 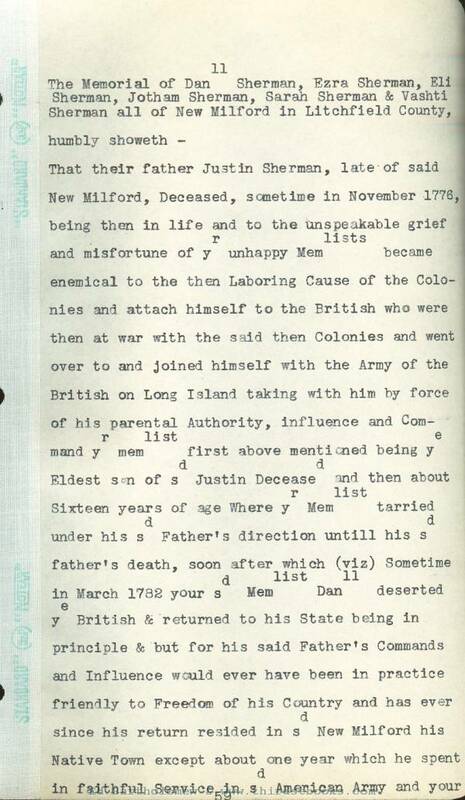 Doc, 467 a. Litchfield County March 1779. At March term 1779. Estates judged forfeited. 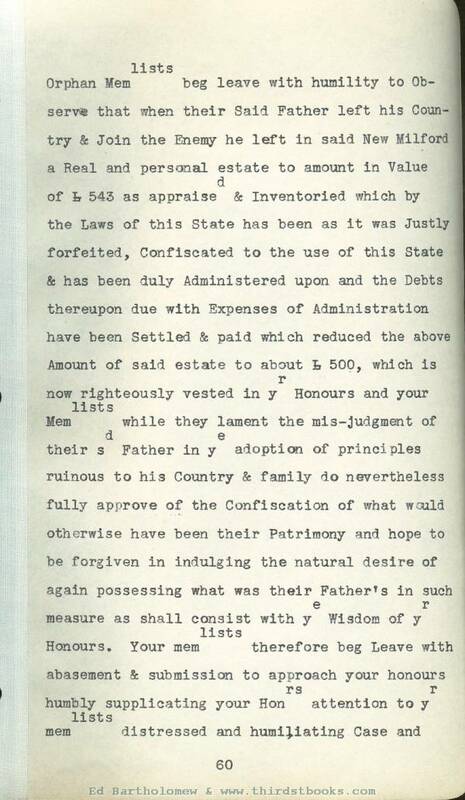 Justin Sherman adjudges to be inimical person and Estate forfeited, third Tuesday in June, 1779. Isreal Baldwin, Clerk. Vol. 34. Doc. 170. Bill for repairing houses on confiscated estates. 1780-40; 3, Justin Sherman's Estate - 80. Copy of Original Petition on file at Hartford, Ct. Concerning confiscated Lands. Vol. 28, document 254 a. Revolutionary War. Plea for Return of Justin Sherman’s Estate.